Why not treat yourself to a perfect golden tan? 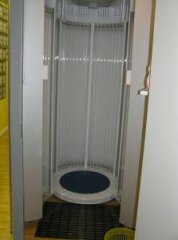 Our sunbed is fitted with the latest high-powered Cleo ® tubes that take only 10 minutes to give you the results you want. We can also advise you on the ideal tanning routine for your skin type. You don’t have to be a member and we offer discounts for block bookings. A huge selection of moisturising tanning creams and gels are available at Reception, and a member of staff will be happy to advise you on which one would be the most suitable for your skin type.